Firstly, is there anything more to its anatomy than “being a small organ in the abdomen”? Why yes, funny you should ask. The pancreas reaches up to 15 cm in length in humans and is a J-shaped structure, apparently a bit like a hockey stick. The organ is not symmetric, rather it is made of a head (left), body (middle) and tail (right), as shown below. 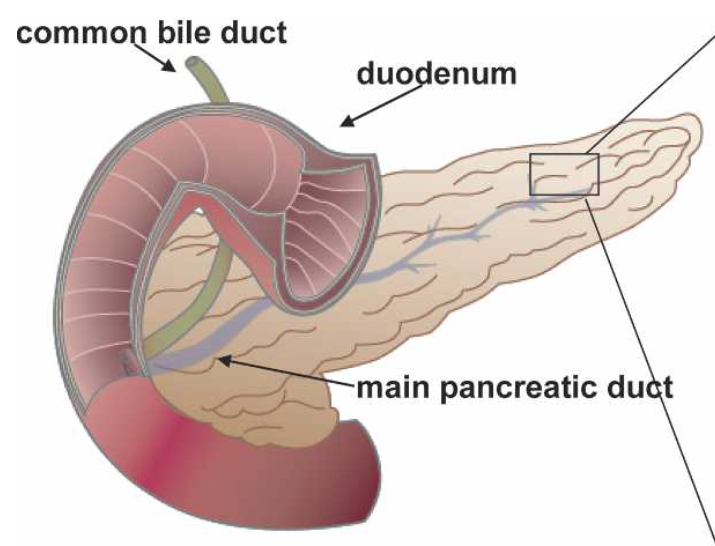 In the head the main pancreatic duct merges with the common bile duct before they join into the duodenum, where food is further digested after it leaves the stomach. As is often the case in biology – and this applies from the level of individual proteins to a whole organism – there is an intricate relationship between structure and function. The pancreas has two main functions: firstly, it contains endocrine cells that produce hormones, such as insulin, to regulate glucose balance (or homeostasis). Secondly, it contains exocrine cells, which make up the majority of the organ, that produce enzymes to aid food digestion. These two categories of cells therefore work together and coordinate the body’s metabolic response to food consumption. Since I am the daughter of two doctors I am usually interested in the pathological side of human biology. What sort of diseases befall the pancreas? Possibly the first that comes to mind is (type I, auto-immune type) diabetes in which the pancreas fails to make enough insulin because the body is attacking its own beta cells that normally produce insulin. Other than that the pancreas can of course become inflamed like any other organ and this is known as pancreatitis. It is caused, among other things, by high doses of alcohol. Lastly, the pancreas can become cancerous. Although there are a few different types of pancreatic cancer the focus will lie on pancreatic ductal adenocarcinoma (PDAC) since it is both the most frequent and also the best understood type. It is one of the deadliest types of cancer because it often goes unnoticed until the tumour has disseminated (or metastasised) in the body – fewer than 10% of people who are diagnosed survive for longer than five years. Therefore it is important to find out more about PDAC. But for the moment there is a lot we do know, decades of hard work that are often frustratingly glossed over. For instance, the genetic mutations that start and maintain PDACs are well known. Among them are activating mutations in a famous oncogene – a gene whose overactivation contributes to cell proliferation and cancer – called KRAS, and deletions of tumour suppressors – those genes/proteins that act as checks and balances and stop cells from overproliferating – such as p16 and p53. Moreover, it is well known when these mutations occur during the development of the cancer. The following image shows how some PDACs form: from healthy tissue to slightly abnormal tissue until it invades into the rest of the body. As for treatment, the most effective method, if successful, is surgery. However, this often involves removing the head of the pancreas as well as parts of the duodenum and this, in turn, means that the stomach has to be surgically joined directly to subsequent parts of the digestive tract, making it a complex procedure. In addition, patients receive radio- and/or chemotherapy, which “targets” most proliferating cells. Targeted therapies that are specific to the cancer cells, as opposed to healthily dividing cells, are, as far as I am aware, not particularly established yet for pancreatic cancer. For surgery to be effective the cancer needs to be detected at earlier stages. In other words, better diagnosis procedures need to be developed. Recently, two papers attracted some attention because they uncovered methods that could potentially make diagnoses easier using either blood (Melo et al, 2015) or urine (Radon et al, 2015) samples. However, as CRUK rightly point out, these techniques need to be refined for them to be able to tell true cancers from chronic pancreas infections. And on that cheery note… Next time you can look forward to learning a bit more about how PDAC is studied in the lab and pancreatic anatomy in slightly more detail. This entry was posted in Factual, PhD and tagged Cell biology, Crick, CRUK, endocrine, exocrine, insulin, pancreas, pancreatic cancer, PDAC, PhD, stem cells by Victoria Wang. Bookmark the permalink.